The JHU mass spectrometry facility is administered by Dr Phil Mortimer. Originally from Montreal, Phil grew up in the UK, where he attended the University of Wales Swansea for both his undergraduate degree and subsequently for graduate research in the field of argon plasma chemistry and Glow Discharge Mass Spectrometry (GDMS) under the direction of Dr Rod Mason. During his graduate work, whilst investigating the ionization processes occurring within electric discharge plasmas using a novel Fast Flowing Glow Discharge (FFGD) ion source developed at Swansea, he accumulated considerable experience in the practices, mysteries and challenges of operating and maintaining complex mass spectrometric and related high vacuum scientific instrumentation. 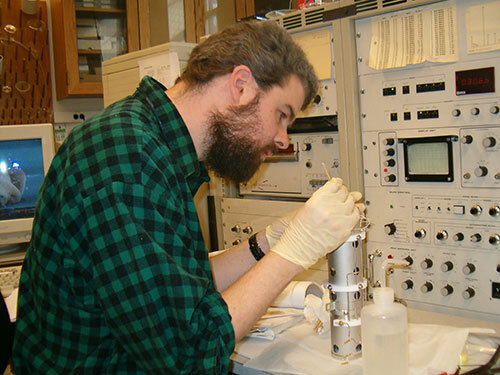 After completing his graduate thesis, Phil continued to work with the Mason group as a research officer, extending his graduate studies as part of a EU Collaborative Research Project to develop a commercial version of the FFGD ion source for use in commercial metals trace elemental analysis. In late 2002, in search of a change of research interest and a dryer climate, Phil moved to Massachusetts to join Aerodyne Research, an R&D company located northwest of Boston. Here he joined the Atmospheric and Cloud Chemistry research group of Dr Doug Worsnop, where he became closely involved with the development and production of the Aerodyne Aerosol Mass Spectrometer, a multi-platform field deployable MS based instrument capable of determining both the size and chemical composition of sub-micron particles in the atmosphere. Such work included both lab studies and field deployment to a variety of sites, including Mexico City (MX), Edwards Air Force Base (CA), Hartford (CT), and Wareham (MA). Phil joined the JHU Chemistry department in Fall 2004 to assume responsibility for the mass spectrometry facility. During his time here, he has overseen the overhaul and upgrading of the facility’s instrumentation and developed and updated operational procedures for the MSF. He may be contacted for mass spectral advice/assistance in the main MSF lab at Rm. B13, Remsen Hall, or at mass.spec@jhu.edu, 410-516-5552. Phil Lives with his wife, Diane, who is a laser specialist, and their three cats in a small village just north of Baltimore. Away from his work, he enjoys a range of pursuits, some of the more unusal of which include home improvement projects, building brass models and attempting to restore his two long wheelbase Land Rovers.